Remember when… all 4-seat, lifted passenger vehicles were generically referred to as jeeps, much like we refer to tissues as Kleenex, or cotton swabs as Q-tips? Remember when they were most likely to have 4-wheel-drive? Here are a couple of vehicles from that period – a Toyota FJ55 Land Cruiser and an International Harvester Scout 80. Both were the manufacturers’ efforts at coming up with a vehicle for sporting and utilitarian use, carrying more passengers than a pickup, while being able to haul the same loads and get through rough terrain and weather. 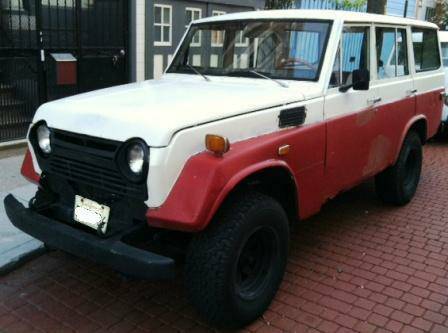 Our first pre-SUV is this 1973 Toyota FJ55 Land Cruiser for sale for $3500 in San Francisco, CA. Yup, that’s crispy. The owner readily states the car has its share of rust and bondo, but he says it’s never been an issue (well, as long as you don’t scrape your leg while getting out) over his ten years of ownership, and he’s been using it as a camping & fishing truck for the high Sierra. He’s generally very emphatic about how functional it is, with a working speedometer/odometer, electrics, new tires, clutch, and exhaust, and Weber carb. 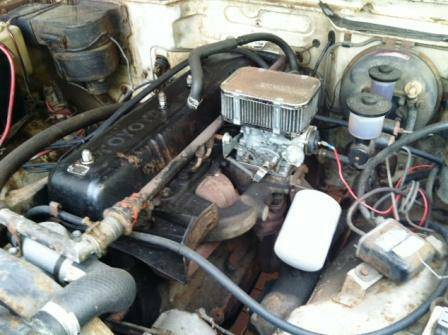 The original six-cylinder/three-speed configuration is said to work well, and the frame is said to be rust-free. The rear window has been replaced by plexi-glass, but other than that, the vehicle looks to be pretty complete. These were Toyota’s first foray into building an off-road station wagon. Most survivor FJ55s at this point seem to be restored vehicles, so this is a relatively low bar to entry into an FJ55. 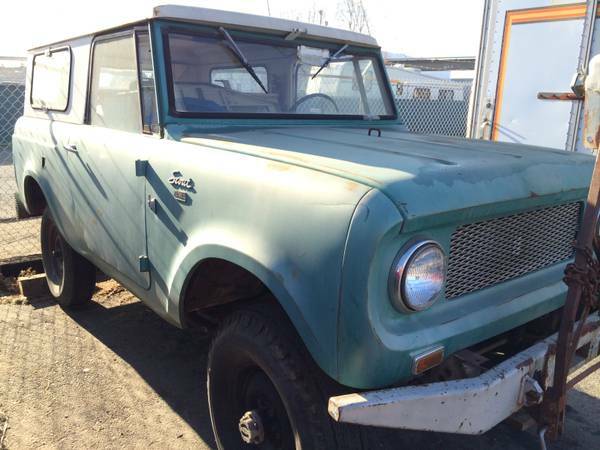 Next up is this 1964 International Scout 80, for sale for $2500 in San Leandro, CA. Scouts were designed with the explicit purpose of competing with civilian Jeeps, but with noticeably more contemporary styling. The original goal was to use plastic body panels in a system developed by Goodyear, but the costs were too great, and it was ultimately built in steel. Unfortunately, Scouts have acquired a reputation for serious rusting. In retrospect, this was perhaps no worse than any other car in like environments, but worse given the conditions to which such a vehicle is often exposed. This one looks quite clean in the photographs offered, and is said to run, but will probably need some attention since it seems to have been stored in an outdoor lot. Perhaps a mechanical and interior freshening would get it as far as it needs to be – it looks great in its aged form. Think of all the things you could do with these old trucks. Things like parking diagonally across 3 parking spots with no shame. This entry was posted on April 11, 2014 at 4:45 pm and is filed under Feature. You can follow any responses to this entry through the RSS 2.0 feed. You can leave a response, or trackback from your own site.